The 60 or so people representing more than a dozen citizen action organizations don't have access to a State of the City forum to express their views on how conditions are faring in their neighborhoods. So they take to the streets to be heard. 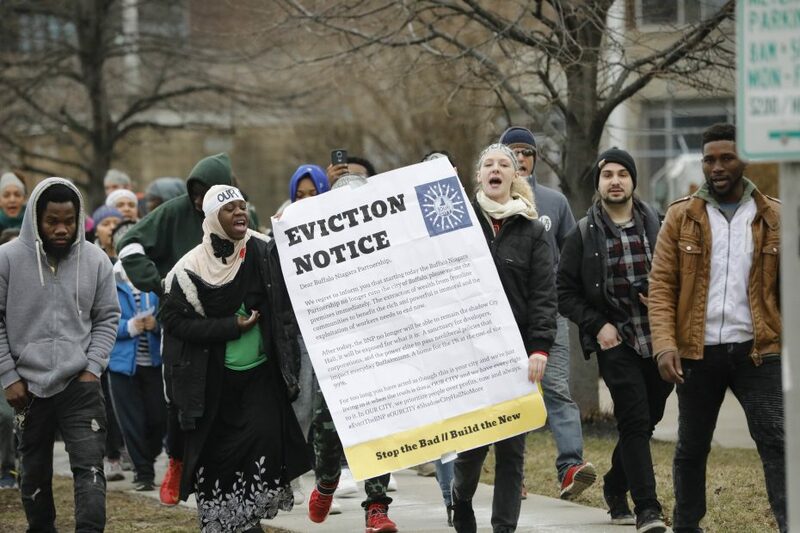 People from the Our City Buffalo coalition assembled Thursday in Niagara Square to go over their plan for direct action, which was to place mock eviction notices on the office doors of city lawmakers. Their aim, they said, was to shut down City Hall and disrupt the goings on at the Buffalo Niagara Partnership, located in a building at 257 West Genesee St.
At City Hall, they got as far as the lobby where their loud chants brought forth security guards who ushered the chanting protesters back onto the streets. The group, still chanting, walked a few blocks down to the building where the Buffalo Niagara Partnership is located. Though the front doors of the building were locked, all it took was one person exiting the building to create a breach that allowed the protesters in. It was at least 15 minutes before police arrived, to see the group exiting the premises. The group had a host of social and economic justice issues and grievances upon which they hoped to engage elected representatives —– from gentrification to community policing. As a coalition, the group has an online Our City platform, specifically targeted at candidates for Common Council. "Yes, we live in a country where direct action or showing up and yelling things in the street has become weird, and abnormal and rabble-rousing, but in reality, that's the heart of American democracy," said Sage Green, an organizer of the protest. "We're told, you're supposed to write it in an op-ed, properly. Or you're supposed to just call your council member. Well, I know a lot of people who call their council member all the time, and nothing has changed," Green added. She and others among the protesters shared the view that, too often, ascending to public office distances lawmakers from their constituencies and what concerns them. "Elected officials are here to serve the people who elected them. In a city where so much of that work is shunted off to partnerships, like the Buffalo Niagara Partnership and others like them, where money and decisions are funneled to a non-elected group, is one of the ways our government stops serving us," Green said.